Italians love flowers. They are an important part of every vegetable garden, where they serve not just to beautify the space but also to attract pollinators that increase yield of many food plants. Flowers are everywhere in Italy’s cities, surrounding doorways, tumbling from window boxes, and climbing up pergolas. And of course Italy is renowned for its vast fields of wildflowers and its beautiful botanical gardens. For anyone who wants to garden like an Italian, flowers are an essential part of the mix! Growing flowers successfully is no more difficult than growing vegetables or herbs. Flowers require the same basic growing conditions: fertile, well-worked soil; lots of sunshine; and regular watering. The differences come in how the seed should be started and how the plants should be spaced and maintained. 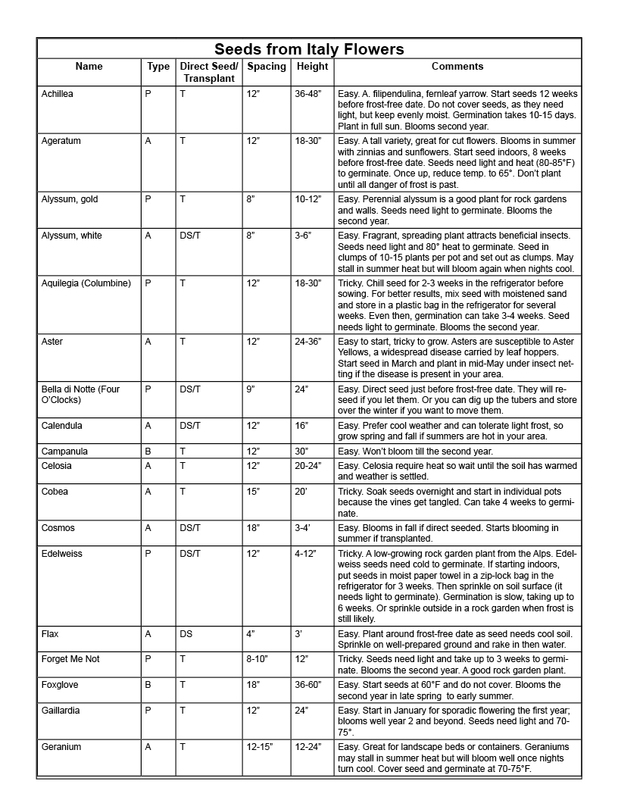 The chart below will give you cultivation information in shorthand for each of the varieties we sell at Seeds from Italy. But, first, some interpretation of the symbols we use. Most of our flowers are annuals, which means they should be planted in spring, and they will bloom the same year. Some are hardy annuals, which can be planted in fall for bloom the following spring. Perennials may not bloom until the second year, but will come back for many years after that. 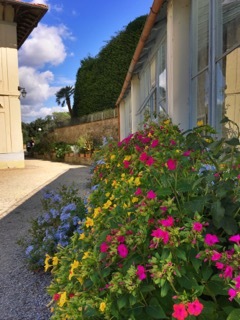 Biennials bloom the second year after planting. All of our flowers are seed-grown varieties. Because of phytosanitary restrictions, we do not import any bulbs, tubers, or live plants from Italy. Many flowers can be direct seeded, which means you can plant the seed right into the garden and thin to the final spacing recommended in the chart. Others are better off started indoors and transplanted. The chart lists the preferred method but most seeds can be planted either way given enough attention and care. Many flower seeds need light to germinate — you will find it mentioned in the notes. I recommend moistening the soil mix thoroughly before you sprinkle the seeds on it. Then cover the seeds with a light dusting of vermiculite, which allows light to pass while holding in moisture. 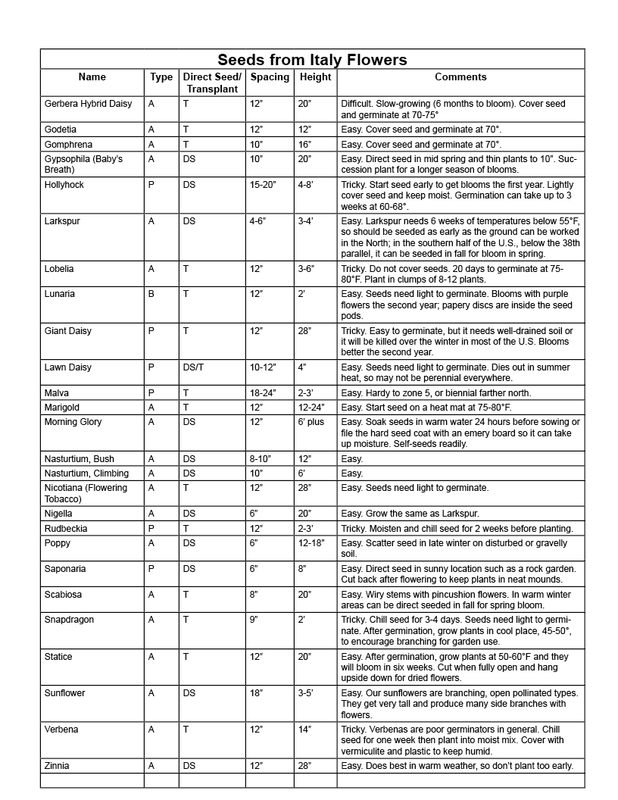 The chart below also tells you the preferred spacing for each variety; it refers to the final space after direct-seeded plants have been thinned. The Notes will tell you whether the variety is Easy, Tricky, or Difficult to grow. Easy means you start the seed in the standard way with no special considerations. Tricky means it's not hard, but you might have to take an extra step such as soaking or chilling the seed before sowing. Difficult means the variety is notoriously hard to grow from seed; only Hybrid Gerbera is in the Difficult category on our list. Lynn Byczynski is a partner at Seeds from Italy and an experienced flower grower. Her book, The Flower Farmer, is widely considered a "bible" for beginning cut flower growers. You can purchase a signed copy here. To download this chart as a PDF, click here.